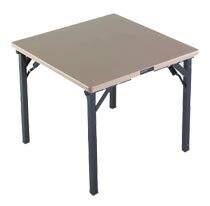 Constructed of high strength smooth finish aluminum, this square folding table design is far lighter than conventional banquet tables. It has an individual folding leg style which is tested to exceed 1,100 lbs of direct weight. Legs come in a standard powder coat Mineral Bronze. 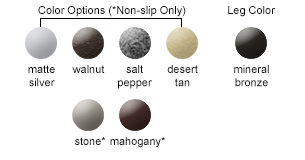 Table tops available in the four colors shown below. The table top is 36" x 36" making it perfectly versatile to fit a wide range of functions.